You didn’t think an awesome new cinematic was all the World of Warcraft news we would get from Gamescom, did you? With patch 7.3: Shadows of Argus rolling out next week, we now have the final patch notes. (Or at least the final patch notes until the first round of hotfixes.) 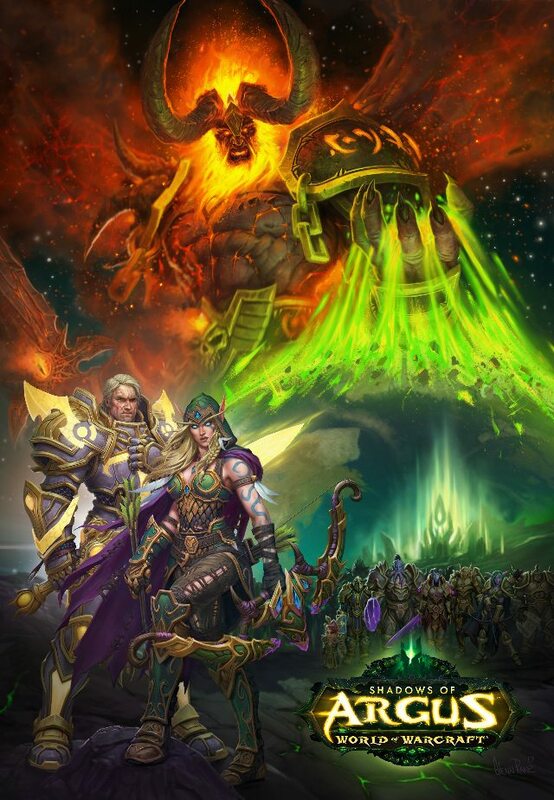 And if that isn’t enough, we also have some amazing new key art featuring Turalyon and Alleria leading the Army of the Light. In short, this is going to be great. If you haven’t been keeping up with the latest patch news, 7.3 is simply packed with content. 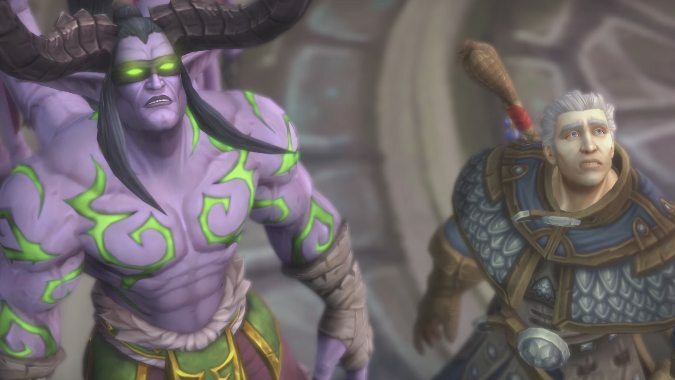 In addition to Argus, a new dungeon, a new raid, a new Artifact customization system, new casting animations, and new pet battles, we have some fairly significant class changes. Frost Death Knights, Feral Druids, and Elemental Shaman have all gotten an overhaul, so you’ll want to take a close look at the patch notes. Then, of course, there’s the most important change: the dressing room pane is now larger. Finally. Azeroth isn’t the only world connected to this hostile place. While on Argus, you’ll unlock the ability to enter the very portals the Burning Legion use to transport to other worlds. Once there, complete an event or defeat a boss to earn epic rewards. As you progress through each of the areas to explore on Argus, you’ll unlock new World Quests and new Emissaries eager for your help. New and updated animations, effects, and audio are coming to all three Mage specs, all three Priest specs, and Elemental and Restoration Shamans. Restoration Druids have updated animations. Your Class Hall and its assorted Champions played key roles in the defense of Azeroth, and their keen efforts are needed to succeed with the new challenges of Argus. You’ll find dozens of new missions, along with new Troop types, and an increase in your Champions’ item level to 950. Mythic Keystone rewards scale up to a maximum of item level 915 in the dungeon, and item level 935 in the weekly chest, both capped at Mythic Keystone 10. This cap in will increase to Mythic Keystone 15 at a future date. The difficulty of Heroic and Mythic dungeons has increased to reflect the improved rewards. Normal dungeon difficulty is unchanged. Advance scouts have reported spotting 18 legendary boss pets scattered about Argus, and these miniature monstrosities have otherworldly special abilities that the denizens of Azeroth have never seen before, such as the slightly terrifying Greater Apocalypse ability. Additionally, more than a dozen different capturable wild pets are said to be found on Argus, as well as a number of pets that can only be obtained via reward items and the new Family Fighter achievement. Professional development turns a new page on Argus, with new gathering nodes for Herbalism and Mining, new material types for Skinning and Tailoring, and a new soulbound reagent: Primal Sargerite. Look for new items that can be created by crafters, as well as a new shoulder enchant that provides materials specific to Argus. In a related turn of events, six renowned NPCs have emerged in the world of fishing. Every day, visit Akule Riverhorn, Corbyn, Ilyssia of the Waters, Impus, Keeper Raynae, or Sha’leth to earn reputation and explore the new rewards they have to offer, and ultimately earn the Fisherfriend of the Isles achievement to unlock a new alternate appearance for your Underlight Angler artifact fishing pole. The Avoidance stat has been reduced in effectiveness by 27% at all levels. The synergy between Hungering Rune Weapon and Breath of Sindragosa has dominated the spec, leaving little room for variety. We’re adjusting this combo, and overall damage has increased to compensate. The result should be a more competitive talent picture. All three level 100 talents are tweaked for balance and to play more smoothly. Hungering Rune Weapon should still be hectic to use and require planning, but should not drastically overcap resources anymore. All damage increased by 14%. Hungering Rune Weapon has moved to the level 100 row, swapping with Glacial Advance, which is now on the level 58 row. Breath of Sindragosa damage increased by 10%. Hungering Rune Weapon duration reduced to 12 seconds (was 15 seconds) and additionally grants 20% haste. Obliteration duration increased to 10 seconds (was 8 seconds). Obliteration now causes Howling Blast to grant Killing Machine (in addition to Frost Strike). Horn of Winter cooldown increased to 45 seconds (was 30 seconds). Murderous Efficiency chance reduced to 50% (was 65%). Koltira’s Newfound Will generates 1 Rune (was 2) and now causes Obliterate to deal 10% extra damage. The following talents have shifted around in the talent tree to provide more choices and allow for better balanced options. This requires targeted balance changes. Runic Attenuation is now level 56, Murderous Efficiency is now at level 57, and Frozen Pulse is now level 90. Freezing Fog effect reduced to 20% (was 30%). Frozen Pulse damage reduced by 39%. Icy Talons bonus increased to 15% (was 10%). Shattering Strikes bonus increased to 60% (was 40%). The utility talent row on level 75 should now provide a better payoff in situations where Frost’s comparative lack of mobility is felt. Volatile Shielding now causes Anti-Magic Shell to generate 100% additional Runic Power (was: removes Runic Power generation), and no longer deals damage. White Walker replaced with new talent, Inexorable Assault: For every 1 second spent in combat with no enemy within 8 yards, you gain a stack of Inexorable Assault. Each stack causes your next autoattack to deal additional Frost damage. Mass Entanglement is now a 15-yard AoE around the target. Prowl cooldown reduced to 6 seconds (was 10 seconds). Rebirth is now castable in all forms. Feral’s updates are focused on addressing two issues with the spec: reducing the dominance of complexifying talents such as Savage Roar, Jagged Wounds, and Bloodtalons, and reducing the damage gap between learning the spec and playing it perfectly. Feral has traditionally been a high skill-cap spec, and we have no intention of changing that, but this suite of updates should make the spec more approachable and less punishing for those still learning its nuances. All damage increased by 33%. Bloodtalons damage bonus reduced to 20% (was 50%), and now additionally procs from casting Entangling Roots. Elune’s Guidance cooldown reduced to 30 seconds (was 45 seconds), and combo points granted reduced to 5 + 5 over 5 seconds (was 5 + 8 over 8 seconds). Fixed a bug with Incarnation: King of the Jungle, where Ferocious Bite’s optional additional 25 energy cost wasn’t being reduced by 50% as intended. Incarnation: King of the Jungle now only allows the use of Prowl while in combat once throughout its duration, and now reduces the cost of all Cat Form abilities by 50% while active (was 60%). Jagged Wounds now causes your Rip, Rake, and Thrash abilities to deal the same damage as normal, but in 20% less time (was 33%). Moment of Clarity’s damage bonus to affected abilities increased to 20% (was 15%), and now affects Brutal Slash. Predatory Swiftness no longer affects or is consumed by Rebirth. Sabertooth damage bonus to Ferocious Bite increased to 20% (was 15%). Savage Roar duration increased by 50% at all combo point levels, and damage bonus reduced to 15% (was 25%). Tear the Flesh (Artifact trait) now increases damage dealt by Rake by 6% (was 7%) per rank. The following talents have shifted around in the talent tree to provide more choices and allow for better balanced options. Elune’s Guidance has moved to level 100 row, swapping with Brutal Slash, which is now on the level 90 row. Jagged Wounds has moved to level 75, swapping with Savage Roar, which is now on the level 90 row. The rhythm and pacing of AoE situations should now feel more consistent with the rest of Feral’s abilities. Swipe Energy cost reduced to 40 (was 45). Thrash Energy cost reduced to 45 (was 50). Thrash Now generates 1 combo point if it hits a target. Savage Roar is generally maintained at full uptime, so the “deals increased damage for their full duration” on it provided no gameplay, only added complication. In comparison, Tiger’s Fury and Bloodtalons still provide interesting gameplay due to their limited nature. Savage Roar now increases the damage of Feral damage over time effects dynamically, based on whether Savage Roar is active or inactive at the time of dealing damage. Previously, Feral damage over time abilities dealt a set amount of total damage over their full duration based on whether Savage Roar was active or not when the damage over time abilities were cast. Tiger’s Fury and Bloodtalons functionality remains unchanged. The Porcupine family has been re-named to Rodent. Rushing Jade Wind damage increased by 22%. Nearly all damage sources are now covered by Versatility, and these were two that didn’t need to be left out. Touch of Death’s damage is now increased by Versatility. Touch of Karma’s damage is now increased by Versatility. The Paladin class mount vendor now offers a glyph that allows Paladins to transform their Divine Steed into their class mount. Blessing of Sacrifice should now robustly prevent against reducing the casting Paladin below 20% health. Developers’ note: This is a bugfix to Blessing of Sacrifice to eliminate the issue with it reducing you to below the listed health amount, and even occasionally killing you. It should now be safe to rely on it to perform as expected. Traits and legendaries that buff Crusade should still be attractive, but not as far ahead of the pack as they previously were. All damage abilities increased by 6%. Chain of Thrayn now correctly, additively stacks with Crusade. Wrath of the Ashbringer trait bonus reduced to 2 seconds per rank (was 2.5 seconds per rank). Mastery’s effect on Judgment damage increased by 46%, and Mastery’s effect on Judgment debuff strength increased by 17%. Execution Sentence damage increased by 17%. Righteous Blade trait bonus reduced to 4% per rank (was 5% per rank). Unbreakable Will is no longer triggered when you’re under the effect of Sleep Canister. There should now be much less DPS and survivability swing between Seraphim and non-Seraphim builds. Non-Seraphim builds now do better damage, and Seraphim builds do not sacrifice as much defense as they previously did. Damage increased by 8%: Avenger’s Shield, Judgment, Hammer of the Righteous, Blessed Hammer, Consecration, Shield of the Righteous, Eye of Tyr. Bulwark of the Silver Hand now gives 35% Armor (was 20%). Earthquake damage increased by 19%. Static Overload redesigned: After using Stormkeeper, your next Chain Lightning causes Elemental Overload to trigger on every target. Elemental continues to have strong AoE capabilities, but we want to help make their single target damage a bit more attractive. All damage abilities increased by 6% (with the exception of Chain Lightning). Earth Shock damage increased by 7%. Frost Shock damage increased by 13%. This set of changes gives Elemental much more room to benefit from their mastery stat before reaching the hard cap of 100% proc rate. Elemental Blast damage increased by 7%. Elemental Blast now provides 2000 stats at level 110 (was 2400). Elemental Overload now does 85% of base damage (was 75%) and its proc rate has been reduced by 17%. Totem Mastery: Storm Totem bonus reduced to 5% (was 10%). Healthstone now heals 25% of the user’s health at all levels. Developers’ note: Healthstones should be more useful at current endgame health amounts. Juggernaut damage bonus reduced to 3% per stack (was 5% per stack). Execute damage increased by 20%. The Tier 3 Class Hall research bonus now costs 1,000 Order Resources (was 2,000). The Tier 4 Class Hall research bonus now costs 2,500 Order Resources (was 4,000). The Tier 5 Class Hall research bonus now costs 5,000 Order Resources (was 8,000). All research durations for changing a bonus have been reduced 1 day (was 3 days). The cost to change the Tier 7 research bonus has been increased to 5,000 Order Resources (was 2,000). Added support for Argus world quests and missions. Players can no longer swap equipment in Mythic Keystone dungeons while under the effect of the Bursting or Grievous damage-over-time effects. Attack Power has been removed from all player gear and replaced with Strength or Agility, except in cases where those stats would be inappropriate (such as guns). Many holiday-themed items now have substantially-reduced cooldowns when their associated holidays are active. Many legacy class set items that did not have a sell price now have a sell price. Artifact Power items no longer have a sale price, as they should always be useable. Hidden Appearances – You are no longer required to be using your current specialization’s Hidden Artifact Appearance to gain progress towards unlocking its 3 color variants. You can now gain progress towards unlocking the 3 color variants of your Artifact’s Hidden Appearances set while you are in any spec and using any Artifact appearance. Challenge Appearances – You are no longer required to be using your current specialization’s Challenge Artifact Appearance to gain progress towards unlocking its 3 color variants. You can now gain progress towards unlocking the 3 color variants of your Artifact’s Challenge Appearances set while you are in any spec and using any Artifact appearance, as long as you have unlocked the base challenge appearance for a given spec. The Appearance requirement “Defeat all Legion dungeons” has been changed to “Complete 10 different Legion dungeons”, and now includes Seat of the Triumvirate. Garb of the Astral Warden 2-piece set bonus redesigned and now causes Thrash to deal 15% increased damage (was “Thrash generates 1 combo point if it hits a target.”). Garb of the Astral Warden 4-piece set bonus now causes Shred and Swipe to deal 8% increased damage for each Bleed effect you have on the target (was 15%). The Regalia of the Skybreaker 2-piece bonus now reduces Storm Elemental cooldown by 2 seconds (was 1.5 seconds). Fierce Gladiator’s Cloak’s rating requirement has been increased to 2300. Additional Artifact Power tokens are awarded to players that win Arena matches based on the player’s rating, starting at 1800. Enchanter’s Illusion – Glorious Tyranny is now available to purchase from Prideful Gladiator vendors, for characters who earned Duelist: Season 14 or Duelist: Season 15. Enchanter’s Illusion – Primal Victory is now available to purchase from Warmongering Gladiator vendors, for characters who earned Duelist: Warlords Season 1, Duelist: Warlords Season 2, or Duelist: Warlords Season 3. Pets in PvP are now immune to Taunt effects for 20 seconds after being Taunted. The totem summoned by Grounding Totem will no longer take damage from spells that are redirected to it. The Shop has a new checkout interface. You can now turn left and right with the Move Pad accessibility feature.